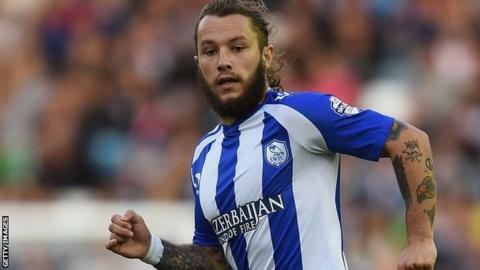 Stevie May scored twice as Sheffield Wednesday ended their 11-game winless run with victory over struggling Wigan. Jose Semedo hit the post early on for the hosts before Wigan took the lead through Chris McCann's powerful header from James McClean's corner. Wednesday equalised a minute later when May found the net from close range. Lewis McGugan cleared a Wigan effort off the line before May met Chris Maguire's cross and his header was adjudged to have crossed the line. The result leaves Wigan in the bottom three, while Wednesday remain 13th. The home side almost edged ahead when midfielder Semedo, who has registered just one Wednesday goal in four seasons with the club, struck the left-hand upright with a low strike from the edge of the box. Wigan midfielder McCann then went one better, opening the scoring in the 26th minute. McClean curled an in-swinging corner into the box from the right and McCann sent a powerful header into the roof of Keiren Westwood's goal. Wednesday did not have to wait long to respond and equalised a minute later with their first goal in four games. On-loan midfielder McGugan's ball into the box was recovered by Austrian Atdhe Nuhiu and he teed up unmarked strike partner May for a simple close-range finish past Latics goalkeeper Scott Carson. The visitors almost regained the lead eight minutes after the restart when a scrambled goal-bound header was cleared off the line by McGugan following a Ben Watson corner. Goalscorer McCann then diverted Callum McManaman's low cross wide of the Wednesday goal before May turned the contest in the Owls' favour in the 71st minute. The summer signing from St Johnstone met Maguire's cross from the left and his header hit both posts before being adjudged to have crossed the line. Wigan went close to equalising in the 86th minute when McClean outpaced the Wednesday backline before rolling an effort towards goal, which was cleared by Liam Palmer. "I thought we went 1-0 down against the run of play, it was unusual for us to concede a goal from a set-play, but it was the response I got from the players which was fantastic. "I think we thoroughly deserved the win today. "I kept saying to the players, the harder you work, the luckier you'll get and maybe that's the little bit of luck we deserved today because we didn't get it last week at Huddersfield. "It has been a long time coming." "I'm disappointed for the players because I thought that they came up here to a tough away game and dominated the ball. "Second half, I always felt comfortable and we had various chances on their goals and never really felt in danger until we gave them the ball when we were in complete control of it. "What I've seen from the group so far has been a willingness to work hard, an honesty about them and good quality from a number of them so it's a reasonable start in the first seven days, in terms of that." Match ends, Sheffield Wednesday 2, Wigan Athletic 1. Second Half ends, Sheffield Wednesday 2, Wigan Athletic 1. Attempt missed. Andrew Taylor (Wigan Athletic) left footed shot from outside the box is just a bit too high following a set piece situation. Josè Semedo (Sheffield Wednesday) wins a free kick on the left wing. Substitution, Sheffield Wednesday. Caolan Lavery replaces Royston Drenthe. Hand ball by Andrew Taylor (Wigan Athletic). Corner, Wigan Athletic. Conceded by Tom Lees. Attempt missed. James McClean (Wigan Athletic) left footed shot from the right side of the box misses to the left. Assisted by Ben Watson. Attempt saved. Lewis McGugan (Sheffield Wednesday) right footed shot from outside the box is saved in the centre of the goal. Assisted by Royston Drenthe with a cross. Corner, Sheffield Wednesday. Conceded by Callum McManaman. Offside, Sheffield Wednesday. Atdhe Nuhiu tries a through ball, but Josè Semedo is caught offside. Attempt missed. Lewis McGugan (Sheffield Wednesday) right footed shot from outside the box misses to the left. Roger Espinoza (Wigan Athletic) wins a free kick in the defensive half. Attempt missed. Lewis McGugan (Sheffield Wednesday) right footed shot from outside the box is too high. Substitution, Wigan Athletic. Roger Espinoza replaces Adam Forshaw. Offside, Sheffield Wednesday. Lewis McGugan tries a through ball, but Stevie May is caught offside. Attempt missed. Callum McManaman (Wigan Athletic) right footed shot from the right side of the box misses to the left. Ben Watson (Wigan Athletic) wins a free kick in the defensive half. Goal! Sheffield Wednesday 2, Wigan Athletic 1. Stevie May (Sheffield Wednesday) header from the centre of the box to the bottom right corner. Assisted by Chris Maguire with a cross. Attempt blocked. Jeremy Helan (Sheffield Wednesday) left footed shot from the left side of the box is blocked. Assisted by Chris Maguire. Corner, Wigan Athletic. Conceded by Glenn Loovens. Attempt missed. Josè Semedo (Sheffield Wednesday) header from the centre of the box is close, but misses to the right. Assisted by Royston Drenthe with a cross following a corner. Corner, Sheffield Wednesday. Conceded by Emmerson Boyce. Attempt missed. Lewis McGugan (Sheffield Wednesday) right footed shot from outside the box is high and wide to the right from a direct free kick. Liam Palmer (Sheffield Wednesday) wins a free kick in the attacking half.